Riverside Grange is a not-for-profit organisation. It specialises in providing outstanding Alzheimer’s residential care to the elderly as well as those suffering with dementia and mental health conditions. Each year, the care home relies on donations from the public to cover the running costs and to provide comprehensive care to its residents. Axis for Business, ran a series of themed activities during the World Cup. These activities included football scratch cards, sweepstakes, raffle draws, quizzes, and dress down Fridays. Axis for Business also asked staff to donate spare change to help maximise donations. The four-week World Cup themed fundraising event raised a grand total of £425, Axis for Business managing dDirector David Meyers matched the amount raised from his own pocket to make the overall donation amount up to £850. Axis for Business is the UK’s leading business telecoms and utilities provider. The business has been operating since 2001 and regularly supports charities in East Yorkshire. Previously, Axis for Business raised nearly £2,000 for Riverside Grange in World Cup 2010 and Wimbledon 2011. 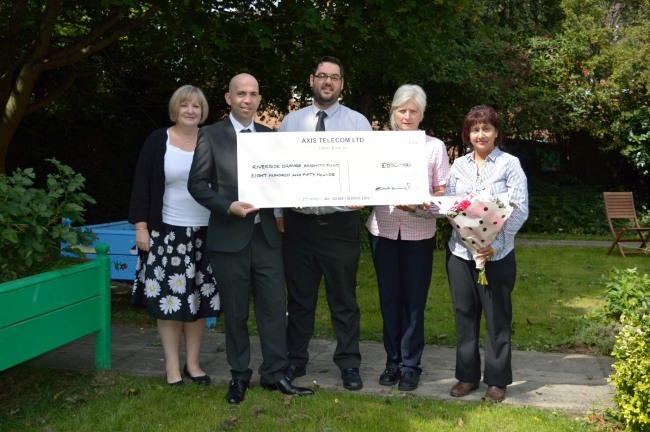 “On behalf of our staff and residents, we would like to thank Axis for Business for this generous donation. “Supporting local charities has always been part of our corporate social responsibility. “We hope the residents enjoy the additional activities they’ll be provided with thanks to this donation.